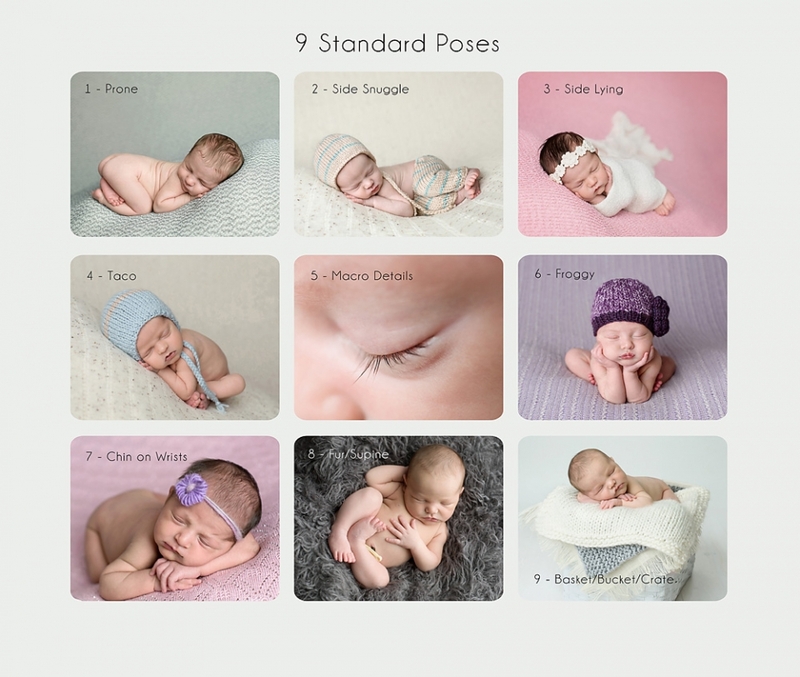 I have many clients ask which newborn poses will be included in their session, and the answer is: It varies! There are some standard poses that are included in nearly every session. Please remember that, while not every baby will perform every pose, I do my very best to at least attempt (and usually achieve) every pose listed below (time permitting and if baby cooperates). It really does depend on baby’s cooperation level at the session. Some babies may be gassy and may not be comfortable lying on their tummies. 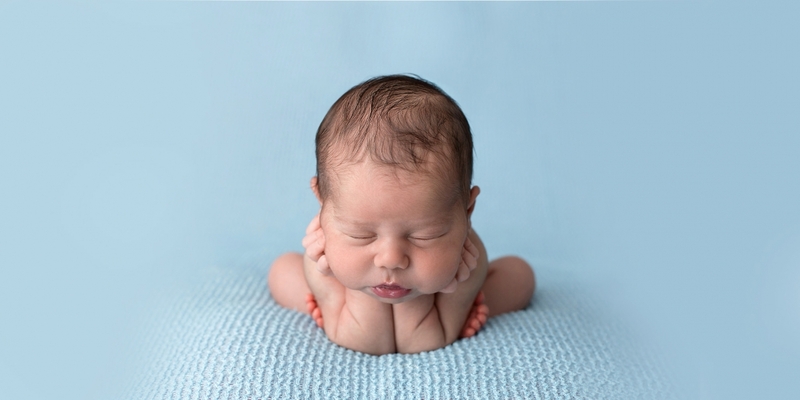 Some babies may not like the Froggy pose. Some babies may choose not to sleep at all during their session! Most babies under the 8 day mark will achieve all of the standard poses. Once baby starts getting older (day 10+), they are less sleepy and flexible and posing *can* become more difficult. I am normally able to photograph baby on 2 different blankets with various poses on the beanbag (ex. #1-7 standard poses below), 1 overhead/bird’s eye shot (ex. #8 standard pose below), one straight ahead prop (ex. #10 standard pose below) and perhaps 1 wrapped pose. Parent & sibling portraits are usually also able to be captured (ex. #1-4 additional poses below). 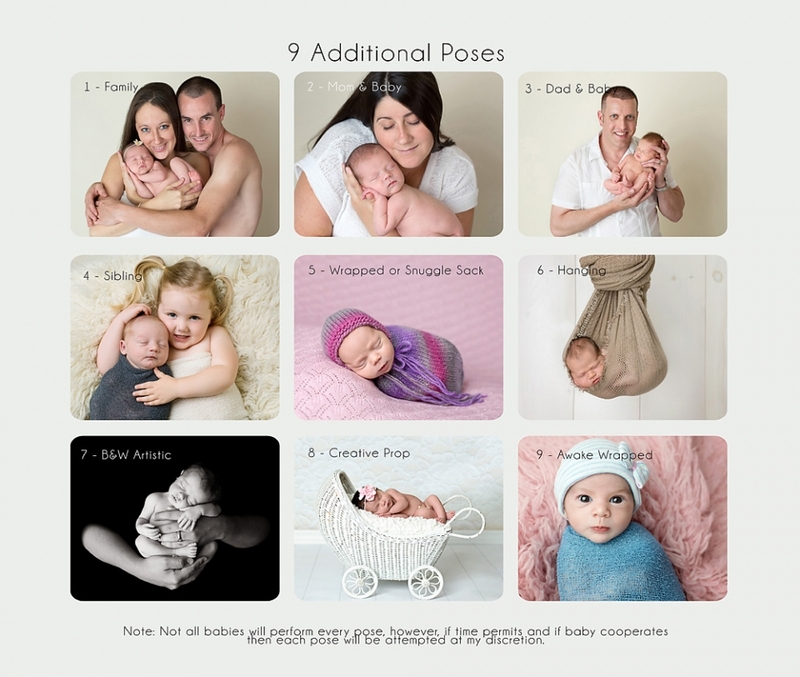 Additional posing is offered if time permits and baby cooperates, including additional family, parent, sibling and artistic poses. I will not risk baby’s safety in order to achieve a specific pose, therefore, all poses are done at my discretion. It is important to follow the guidelines outlined in the Prep Guide that I send to you prior to your newborn session. Although I cannot guarantee that your baby will cooperate, following these guidelines will increase your chances of a successful session. Please also note that while I do encourage bringing a sentimental item to incorporate into baby’s session I do not take ‘Pinterest’ requests for specific poses or set ups. My session flow allows me to transition baby from one pose to the next with very little disturbance and doing multiple unique set ups will lead to an awake and unsettled baby. I have a plethora of props for you to choose from in my studio, as well as hats, headbands and outfits!